The Burgos Cathedral is a masterwork of Gothic Architecture. Its layout resembles that of contemporary cathedrals in the north of France. The first phase of construction took place between 1221 and 1293. Toward the middle of the 15th century, a set of further embellishments was made. An international team of architects and artists worked on the front spires, chapel and the choir in late Gothic style. Later on, Renaissance additions were made. The cathedral is also the burial place of the Spanish national hero El Cid and his widow. I had only an hour to spare before my flight back home, but thought that that would be just enough to see another cathedral. The first noticeable aspect in the area is the marvellous town gate Arco de Santa Maria. It gives entrance to the square where the cathedral is situated. The Burgos Cathedral itself is an enormous complex, built over several centuries. There was a long queue for the ticket office, so I just walked an entire round around the cathedral (quite a hike, on various levels). When I arrived back at the entrance, the queue fortunately had gone so I did get in eventually. There are lots of chapels, each with their own kind of decoration. My favourite part of the building was the 16th century Golden Staircase. Burgos is a town busy with tourists and pilgrims alike. The city looks pleasant enough, so to other visitors I would suggest to tour the nearby Atapuerca WHS during the day and stay overnight in Burgos. 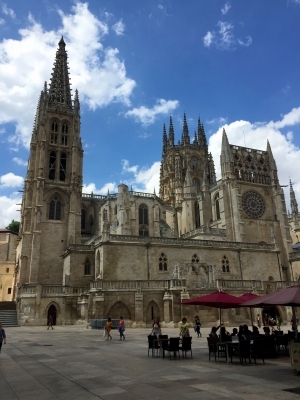 The impressive 88-meter twin towers of the Burgos cathedral not only dominate the landscape of the town but also represent one of the most significant Gothic buildings on the Iberian peninsula. While from the outside, it appears similar to many other significant cathedrals, like Reims, it is the inside decoration that really makes it stand out. The numerous chapels are individually decorated with Spanish Renaissance and Baroque elements. The full inside tour of the cathedral takes several hours. For many people, the highlight of the tour is the impressive Golden staircase at the north transept of the cathedral. For me, however, it was fascinating to see the beautiful geometrical ceilings of the various chapels. It is clear that the Medieval donors have invested heavily into the decoration of the chapels, as they are adorned with elegant sculptures and paintings. Just when you think you are done with the tour of the cathedral you turn into the high cloister, which is brought to life with the colourful stained-glass windows. I will probably be a little biased on the cost-effectiveness of this site, as I managed to enter for free on a Tuesday after 16:30. The regular entry fee of €7 is definitely not small, however, it is somewhat justified by the extent of the collection of paintings and sculptures that it provides access to. I visited this WHS in May 2016. 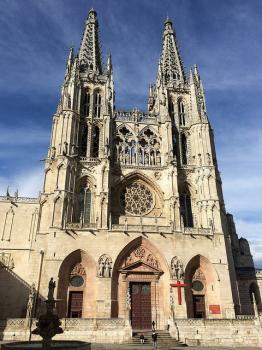 I stayed in Burgos for 3 days as it was my first resting point along the Camino Frances. 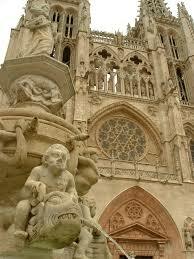 It is the only cathedral in Spain which is solely inscribed as a WHS (without the rest of the historic centre). And rightly so; if you were to choose only one cathedral in Spain, make sure you visit this one as you won't regret it. Its gothic exterior is decorated with several facades, sculptures, gargoyles, statues, an octagonal tower, etc. and its sheer size alone is mindboggling. I visited at different times of the day and always found something new to gaze and marvel at. The original statues can be admired inside, just near the cloister, and they will help to grasp the immense size of this cathedral. In front of the main facade (picture) is a lovely fountain and just next to it, on the floor is the UNESCO WHS plaque which most miss while looking up at the cathedral spires. Just next to the Church of St Nicholas, again on the floor, lies the only UNESCO WHS plaque in Spanish commemorating the Camino's inscription. I would recommend a visit of the cathedral's interior with a complimentary informative audio guide but you'll have to allow at least an hour or two to take in the never ending chapels, retablos, stucco, ceilings, tombs, etc. My favourite highlights were the Gothic staircase and the Renaissance Golden Staircase, the Gothic Plateresque dome and the Papamoscas statue. I would recommend visiting first thing in the morning to beat the crowds, while a short walk uphill to the castillo in the evening will be rewarded with a beautiful panoramic view of Burgos and its cathedral. This is definitely one of Spain's best WHS. I visited Burgos twice. The first time was 1990. I don't remember too much about this trip, but what I did remember is the outside of the cathedral. I went again 2001 and I was surprised with the cathedral. It looks like amizing after the clean up. I would suggest also to visit " El monasterio de las Huelgas" also in burgos city and Santo Domingo de silos. It is a medieval village not so far from Burgos. Visited as teenager in 60s by steam train, before the 'clean-up'. Quiet enough then for kids to play in the street and Spanish enough for them to think my red hair was amusing! Burgos Cathedral is one of the Spaniard historical events and places the old church that unite the people of Spain. A lot of wonders and miracle happen in this church the Catholic are the dominant religion in Spain, I love the design of the church and art. Burgos Cathedral is wonderful, its realy an outstanding art piece. I think it is the most beutiful building in west-europe! come to see it. Burgos cathedral has now a fully restored clean stone exterior, so for the first time in a hundred years you can see what the designers intentions really meant for the viewing public. God didn't build many like this one. 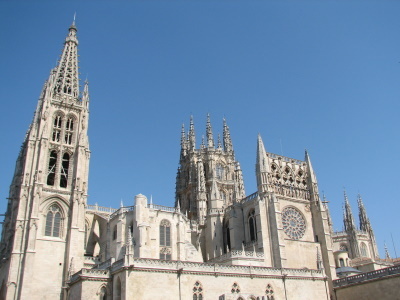 Burgos is a beautiful cathedral, with outstanding artwork, and it houses the tomb of El Cid. It is well worth the admission, although charging people to enter a house of God rankles. I've been in Burgos several time for work, and during each transfert I went back to the Cathedral, which is really a wonderful monument. Built in the 13th century: The first phase of construction took place between 1221 and 1293. 191 Community Members have visited.